Marketing resources (time, money, people power) need to be carefully allocated to ensure REO. 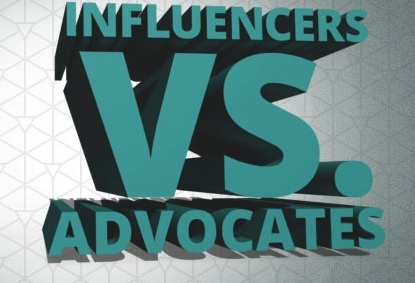 In your social media campaign, is it better to pursue influencers or create advocates? In the early 1980s, a commercial for a popular shampoo featured a young Heather Locklear who loves the results of Fabergé Organics shampoo so much that she is compelled to “tell two friends.” Then the screen splits into two frames with Heather Locklear’s smiling face, the line repeats, the screen split into two again, and so on, until the entire screen is filled with happy Heather Locklears. 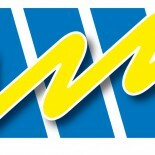 It was an extremely effective visual demonstration of the power of word-of-mouth advertising. The obvious extrapolation is that, given time, everyone in the world will be using, loving, and “telling two friends” about this wonderful shampoo. 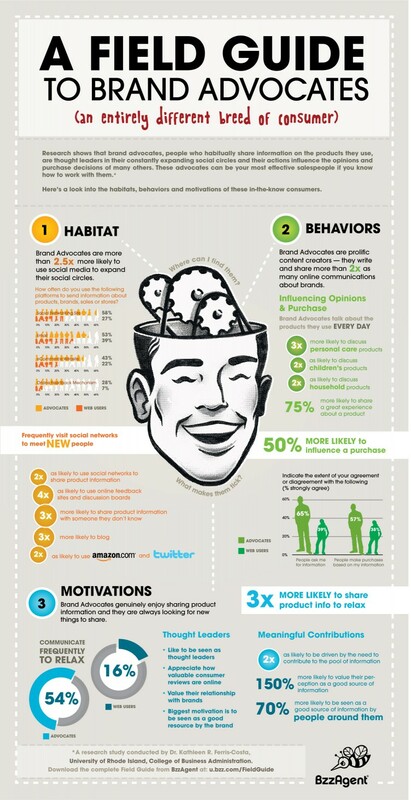 Word-of-mouth has always been an incredibly powerful source of customers. With the explosive growth of social media , word-of-mouth is no longer limited to talking with two friends. Social media is now the top internet activity: 74% of adults are now on social networking sites. With social media sites like Twitter, Facebook, and Instagram, everyone who wants one can have the equivalent of a megaphone with which to shout his or her opinions to the world. In the last decade, some social media users have emerged as what brand marketers refer to as “influencers.” Essentially, these are super connected social media users whose opinions, insights, and observations have the power to shape how people think about an issue, inspire trends, and even make or break the adoption of a product. These influencers have large audiences and are highly coveted by brand marketers, who see them as the key to social media marketing. After all, if you can get an A-list influencer like Robert Scoble, high tech blogger, author of nearly 67,000 tweets since 2006 and the proud possessor of 425,000 followers on Twitter alone to talk up your product, then you’ve got this social media thing mastered, right? It’s counterintuitive, but no. It isn’t just about the number of followers an influencer has, or their ranking in their industry, or the amount of traffic on their blog. It’s vital to make sure that they have credibility, the reach, and most importantly, their audience is the same one you want to reach. So how does it happen? Marketing teams need to research possible influencers, then establish relationships with them. It takes work, constant communication, and, to a degree, a quid pro quo where a company provides the influencer with a free sample or period to use a product, with the understanding that they will write about it. Leo Leporte, founder of Tech Guy Labs, has a blog, a podcast, and a radio show. He’s transparent with his audience about his relationships and he reviews products fairly, which is one of the reasons he is named a top social media influencer. But there is argument among marketing experts as to whether the pursuit of influencers is the right way to expend valuable marketing energy. 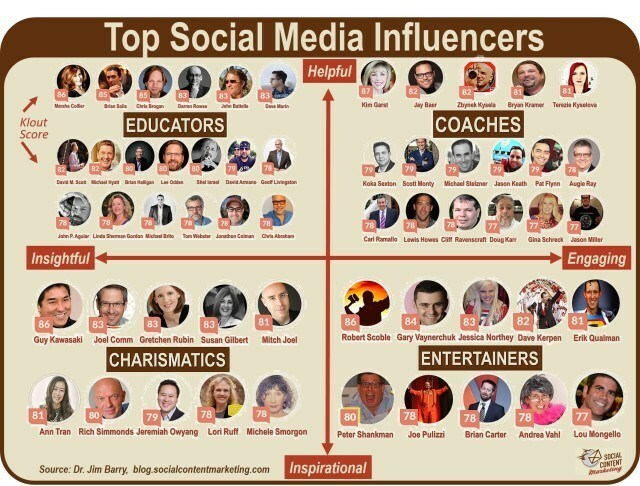 Jay Baer, of Convinceandconvert.com goes as far as to say that influencers are overrated. He points out that having followers doesn’t mean that an influencer has an actual ability to drive action. They are missing, he says, the passion of a true advocate. After all, an influencer may mention or blog about your product or company once…but a true advocate believes in the product, actually uses it (without you having to provide it to them), and will promote it as an authentic customer. When it comes down to it, who is an influencer? And why is someone else described as an advocate? This chart explains. Neilsen research shows that 92% of social media users are more likely to trust brand advocates over influencers. Brand advocates are highly satisfied customers who go out of their way to actively promote the products they love and care about. They also are genuinely motivated to help their followers by sharing information about a product or service that has made a genuine difference in their own lives. Brand ambassadors essentially become an integral part of a company’s social marketing team, though they are not on the payroll. 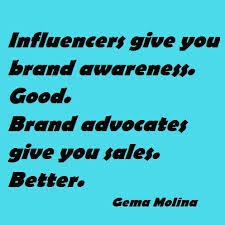 Social media influencers can make great brand advocates. So how, as a marketer, do you turn an influencer into a genuine advocate? It’s essential to build credibility, create an emotional connection, and generate brand loyalty. First, identify key influencers and engage with them. Develop a relationship. Give them a first hand experience with your product or service. It’s important that you approach them from a “what can we do for you?” perspective as opposed to a “What will you do for us?” point of view. Influencers want to provide information of genuine value to their followers—after all, they’ve worked tirelessly to make themselves relevant in the lives of the people who follow them. Help them continue to stay on top by giving them information that they deem is worth sharing with their audience. Also, allow them the freedom to use their own “voice” when relaying the information you provided to their audience. After all, they know their audiences better than you do, and know how to “speak” to them via social media. Show them that being actively involved with your brand is a good experience. Overtime, the transition from influencer to advocate will be complete. In today’s world, word-of-mouth is more important than ever. And it is more important now than ever for marketers to understand how to make the most of it. After all, these days, Heather Locklear isn’t going to tell two friends about the great new shampoo she’s discovered–she’s going to tell two thousand, with a single tweet. 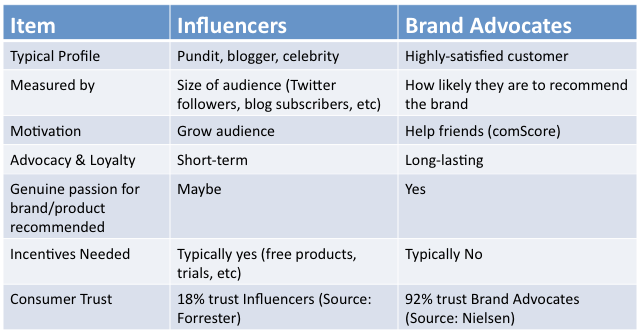 In your experience, are influencers less valuable to a brand than advocates? Share your thoughts in the comment section below. I loved this article! I am a fervent advocate of brands that I really like, and always happy to recommend them to my friends, so I could really relate. One of my favorite brands is Southwest, and I they are always my first choice domestically because they don’t charge me for luggage, I can always use my reward points if seats are available, and I can change any flight anytime (even cancel at the last minute), and not have to pay a penalty. An important point about building brand loyalty, vs promoting brand influence, is that companies that have fervent advocates deliver on their brand promise and have clearly developed and articulate what that promise is. I personally want to get an influencer to blog or tweet about my product without me asking. That is really hard but the most powerful- in my opinion. Example- I recently send some Arrow DVDs to the production office of the show to be signed by Steve Amell for a promotion we were running and I sent a couple extra for him to keep. Without even asking-he tweeted a photo of himself holding the DVD and announcing its street date–2.7MM dedicated Arrow fans!! At the end of the day, influencers are just people trying to make an impact in the world. He probably really appreciated that you sent him the CDs for him to keep, rather than just want him to sign some and return them to you. You showed him that you appreciate him as a person, not just a way to make your promotion more interesting. A little thoughtfulness goes a long way! This entry was posted on November 19, 2014 by Kim Haman in Uncategorized and tagged brand advocates, brand influencers, Brand loyalty, Brand passion, Marketing, Social networking, Word of Mouth.